The Hawa Mahal in Jaipur, India. Jaipur is the capital and largest city of Rajasthan, the western state of India. It is also part of the Golden Triangle, which is a popular tourist itinerary that includes New Delhi, Agra (where the Taj Mahal is located) and Jaipur. It is called the Golden Triangle because traveling between these three cities will take you on a journey that resembles the shape of a triangle. After visiting the Taj Mahal in Agra, India, I ventured to the pink city of Jaipur. Jaipur is about a 4 hour drive from Agra and considering we were in and out of the Taj Mahal complex by 9AM, I arrived in Jaipur by lunchtime. Jaipur was one of my favorite cities in India. I was delighted by the gorgeous architecture, friendly locals and rich history. 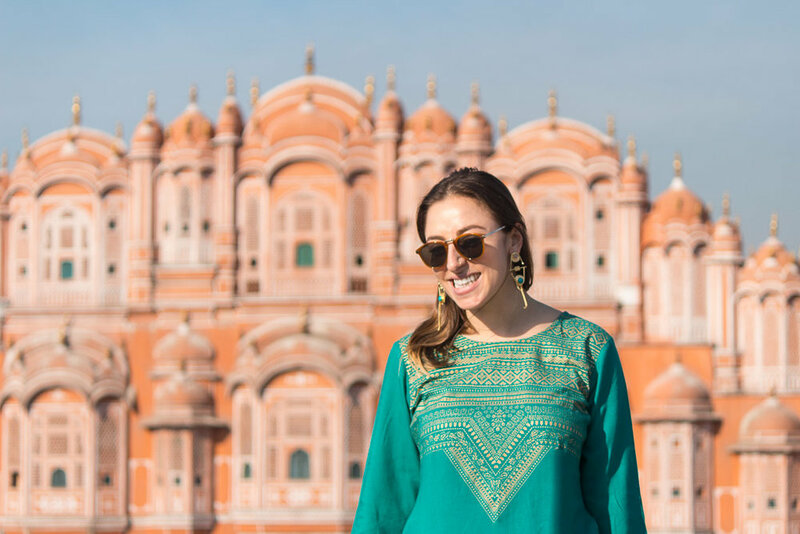 In this post, I share my one day Jaipur itinerary. I hope this post inspires you to make a stop here yourself! Can you guess why Jaipur is called the pink city? 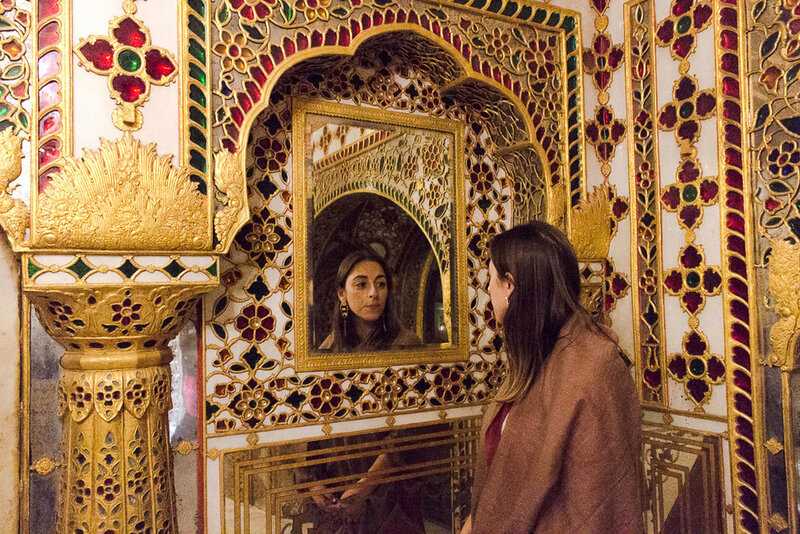 Inside the City Palace in Jaipur. +Start your day by visiting the City Palace, a complex that includes Chandra Mahal, Mubarak Mahal and a few other buildings. The standard entrance fee is 500 rupees (~8 USD) and includes the museum and Jaigarh Fort but this won’t get you access to the Chandra Mahal, which is the jewel of the City Palace. The Chandra Mahal is the royal palace of Jaipur, built in the early 1700s by the Maharaja. The royal family still lives there today, and the tour gives you an inside look at the decorative rooms of this architectural masterpiece. There is a blue balcony covered in scalloped arches, a room of intricate jewel and mirror work, and historical paintings covering the walls. I highly recommend splurging on the 2500 rupee (~40 USD) for the guided tour. I was initially hesitant to pay so much more, but it really is worth the extra cost. Plan to spend about 1.5-2 hours at the City Palace. Inside the mirrored room of the City Palace. 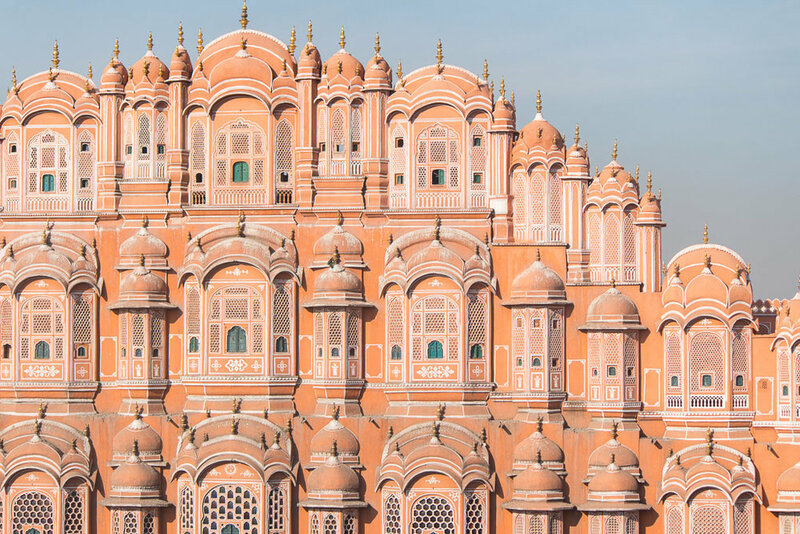 +Your next stop is the Hawa Mahal, known as the Palace of Winds. This tall and decorative palace sits right at the edge of the City Palace. It stands five-stories high with 953 small green windows and resembles a honeycomb. It was built in 1799 for the women of the royal palace so that they could watch the events happening on the street. This was during the time of ‘purdah,’ a religious practice by some Muslim and Hindu communities in which women are secluded from the public. Get this view from the rooftop of the Wind View Cafe. If you’re interested in taking pictures of Hawa Mahal, I recommend walking up to the Wind View Cafe across the street. They don’t require you to purchase any food but by this time you should eat lunch, so take a seat and enjoy the view! The Hawa Mahal is open from 9AM - 4:30 PM and the entrance is at the back of the building. The cost is 200 rupees (~3 USD) and I would expect to spend about 1 hour here. I stumbled upon this Sikh Temple and was welcomed inside. +As a final stop before dinner, I highly recommend visiting the Sikh Temple of Gurudwara Shri Guru Singh Sabha. 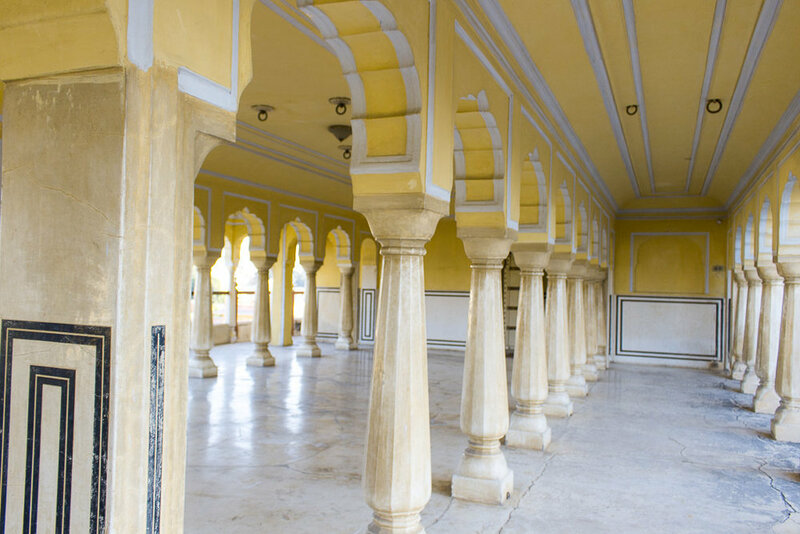 It’s only a few blocks away from the Hawa Mahal and will give you a true taste of the local culture. Religion is a way of life in India, and learning about it while you are there will enrich your experience. I stumbled upon this temple by accident and was drawn to it’s gorgeous architecture and decorative exterior. As I approached the door, a very friendly man invited me in. He offered me a bandana to tie around my head, instructed me to take off my shoes and wash my feet (all by gesturing because he did not speak english), and then walked me inside of the temple to watch. There was a carpeted floor to sit on and watch as a group of men chanting and played instruments. I sat there for about 15 minutes taking it all in, and then approached the shrine to bow as well as offer a few rupees. It is always a bit nerve-wracking to walk into an experience that is so unique to a culture or religion that you aren’t familiar with, but taking these risks will almost always be worth it. +For dinner, I recommend Kailash Veg Restaurant. This restaurant was walking distance from the Hawa Mahal and the City Palace. It is a no-frills local spot, but the food was delicious. I recommend ordering Dal Baati Churma, a lentil based Indian dish. The view outside our Airbnb in Jaipur, India. The location of our Airbnb was perfect because we were walking distance from every spot on our itinerary, but the actual experience was not ideal. I unfortunately can’t recommend staying there, so took some time to curate this list of 5-star Airbnbs close by. In addition, you can search for Jaipur hotels on one of our favorite hotel search websites below. >Jaipur is about a 4 hour drive from Agra. We booked a driver in advance, but you can also take a train between the two cities or directly from Delhi. >Jaipur is a very crowded city and when you stay right in the old city, you’re sure to be a bit overwhelmed while you’re walking around. When you cross the street, I recommend finding a local and following them closely. That is the best way to get by safely. >Jaipur seemed to be one of the most conservative cities when it came to clothing. I recommend covering up your knees and shoulders. I wore a scarf the entire time. >Jaipur has monkeys, cows and dogs on the street. They won’t bother you, but be aware of your surroundings as you walk around town and don’t try to pet the dogs. >To get around Jaipur, there are Tuk Tuks all over the street that you can rent. >If you are interested in purchasing a saree (also spelled sari), I recommend going to the Rattan Deep Saree Showroom. I was unable to find it on Google maps, but it is right next to the ICICI Bank Johri Bazar that I’ve added to the map below. I paid just about $35 for my saree. >For information about visas, immunizations and other important details for traveling to India, review our TBP Insider Tips on our Delhi itinerary. Have you been to Jaipur? What were your favorite sights?